Great Shite? Nah, there's no need for any abusive language. But what if you're once bitten... twice shy? Hah! hilarious (not!). Let's just calm down, shall we? stop messin' around with the poor band and their follower(s). Formed in Los Angeles during the early eighties but never really one of those fun/catchy glam acts from the strip. They've always been a rather basic 'meat and potato' blues/rock band with aggressive riffs and tight but-never-quite great (white) arrangements. 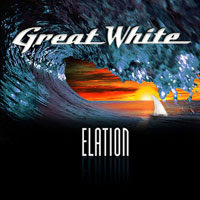 Personally, I think of Great White as the stereotypical U.S. bar band and not nearly as good on record/cd/vinyl/whatever. They are no longer fronted by vocalist Jack 'Dog' Russell and the numbers are not as uptempo as in their heydays. It's quite the laidback affair actually and some of the tracks bare more resemblance to Rod Stewart and The Faces rather than old skool melodic hardrock. Not necesarrily a bad thing in my book as they were never really a great hardrock band in the first place. Terry Ilous of XYZ fame sings and it's notable since both acts (XYZ, Great White) started once out with the help of Don Dokken (he produced and helped them win a recording deal). (I've Got) "Something For You" is no different from all the other bar bands since it's a tiresome mixture of Led Zepplin and AC/DC rock. I'm afraid we've heard it all a thousand times before. "Love Train" is a really slow number which takes you on a journey through the blues as well as Deep Purple influences without ever hiting the nerve. The heartfelt ballad, "Hard To Say Goodbye", Rod Stewart and Rolling Stones did these type of numbers already back in the early seventies and it works out nicely by Great White in 2012 too. At first spin I thought this to be a decent CD with great vocals (true) and decent song material (false). It actually managed to get worse by the spin(s) and merely the vocalist shines throughout the album. LITA FORD: "Living Like A Runaway"
CARMEN GRAY: "Gates Of Loneliness"
REINXEED: "Welcome To The Theater"
SAXON: "HEavy Metal Thunder - Live"
FREEDOM CALL: "Land Of The Crimson Dawn"
The SUNPILOTS: "King Of The Sugarcoated Tongues"